Yesterday I was the solo English teaching at Bangkhonthiinai – khon diaw as they say in Thai. Tod was otherwise engaged, Ken was at home waiting for a plumber to come repair a leaky drain, and Markus was with Tam in Japan. It reminded me of the “early days” of my teaching, when I was often the only person there. One lesson I had to relearn yesterday is to tune out the background noise when working with the children. It seems that a group of children that age are incapable of working quietly unless they are being specifically engaged by their teacher. Sometimes I cannot work with the entire class at once and instead need to work with smaller groups or individuals. During one exercise where a group of children was practicing what to say when someone tells you they have a test or a competition (“good luck!”), the classroom suddenly went from ebullient to silent. I turned around: sure enough, Ajarn Yai was standing at the doorway. It takes the principal to bring order to my classroom. For awhile Tod and I had requested that another teacher be in the room to help maintain discipline. That lasted for a few weeks but has faded away. I don’t blame them; when I (or we) am teaching it creates an opportunity for the regular teachers to get other things done. Still, the incessant din in the background makes it harder to the children to learn because they don’t hear or pay attention to what’s being said. Thailand’s version of “No Child Left Behind” – George W. Bush’s education policy that mandates testing of U.S. students at various grade levels and teachers will tell you results in them simply “teaching to the test” instead of educating the children – is the Sixth Grade National Test. The sixth graders at Bangkhonthiinai will take their test on February 13th and last week I was given a copy of the English language section and asked to review it with the students. The best answer is number 2, but I’d argue that number 1 is completely appropriate, too. Maybe I’m just overanalyzing the test – I did that in elementary school, too – but I’m not sure it is measuring what’s really important. Just as I had given up all hope that ruuduu naew (cold season) would continue and had resigned myself to the arrival of ruuduu ron (hot season), I’ve been pleasantly surprised at its brief reappearance. Sunday morning temperatures were down to 65 F / 19 C and very breezy. This is possibly the coldest I’ve seen here in Khrungthep. And the forecast is for similar overnight lows for the next four or five days. It was perfect riding weather and Sunday morning about 7:30 Markus and I set off to try urban cycling in the Big Mango another time. Our last outing to the old city several months ago was beset by heavy traffic including a university graduation, a parade, and a marathon. Our 24 km circuit was not physically that difficult – all the streets were level and paved – but the mental alertness required when riding in an urban environment makes it much more challenging, I think, than riding in the countryside. 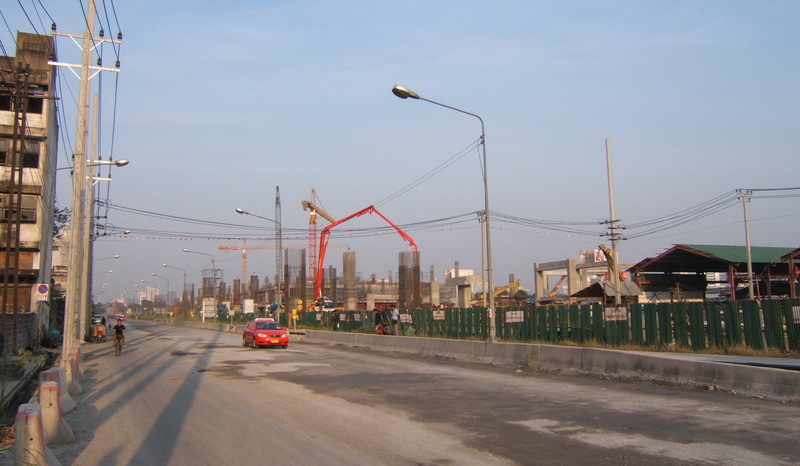 We headed up Asoke to the train tracks and then paralleled them (and the construction site of the new Airport Line inner-city terminal, pictured here) until we reached Thanon Si Ayutthaya, which we followed all the way to the Chitlada Palace Complex, noted on the map below. 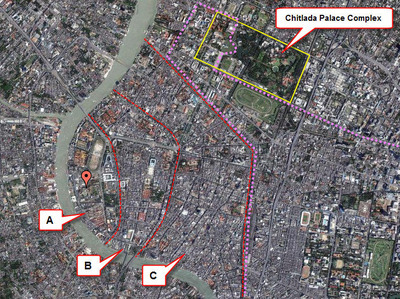 This includes Chitlada Palace, where the King currently lives, as well as (across the street) Dusit Zoo, the Parliament Building, and the Throne Hall. We were able to ride through some of that complex before heading to Khlong Phadung. The older part of Khrungthep is a series of three islands, bordered on the west by the Chao Phraya River and on the east by three concentric, man-made khlongs (canals). The smallest island, labeled “A” on the picture, is Rattanokosin Island. 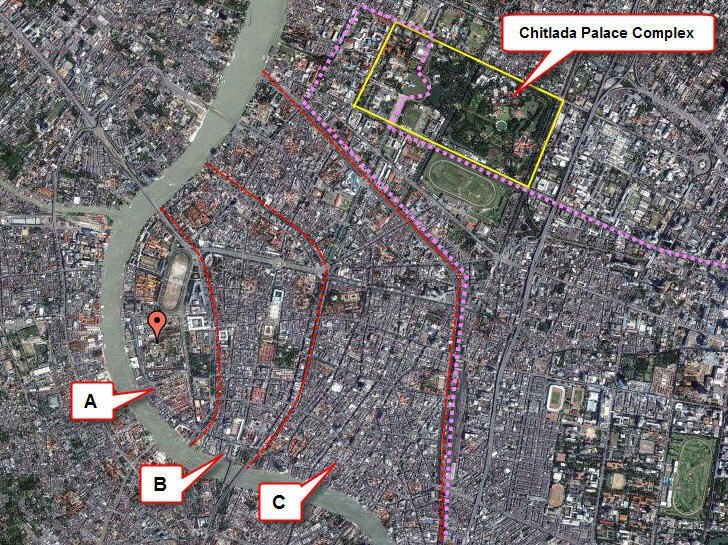 It contains the Grand Palace (indicated by a marker), the Temple of the Reclining Buddha, Sanam Luang parade grounds, and Silpakorn and Thammasat universities. It was the original city founded by King Rama I in 1782. The next island, labeled “B” on the picture, is Phra Nakhon Island. It contains many additional government buildings, City Hall, and the Democracy Monument. There is a fine self-guided audio tour you can take of this part of the old city. The third island, labeled “C” on the picture and defined by Khlong Phadung (dotted line to the right of the island), is actually two different islands as Khlong Mahanak (which becomes Khlong Saen Saeb further east) bisects it near Golden Mount. The north portion is Pom Prap Sattru Phai and contains the UN Conference Centre, the Ratchadamnoen Boxing Stadium, and several government ministries. The south portion is Samphan Thawong and contains the Temple of the Golden Mount (the only hill in Khrungthep) and Chinatown, called Yawarot by locals. Markus and I followed Khlong Phadung along the border of the third island. The khlong changes names a few times but we ended up by Hua Lamphong Railway Station. All along the khlong, the city is doing major reconstruction to improve the area and make it more attractive. 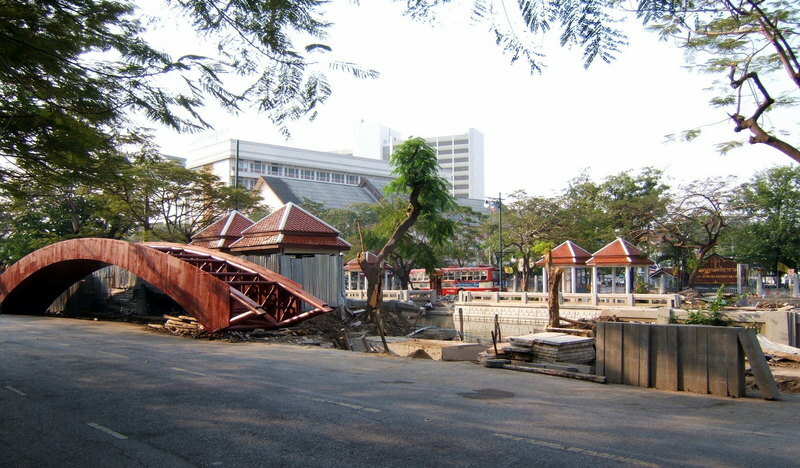 This includes installing new pedestrian bridges (pictured left, waiting to be lifted into place), repaving walkways along both banks of the khlong, installing new lamp posts, and planting more trees. When it is completed, it will be a very nice walk, a smaller version of strolling along the Seine in Paris. With better curry, too. I’ve already written one self-guided walking tour (no audio recorded yet) for the Rama I / Phloenchit area including the Jim Thompson House. I think the next one I write will be for a walk along Khlong Phadung. It passes many interesting sights including a variety of architectural styles and types of markets. Future visitors stay tuned for more developments. Tawn and I have taken some concrete steps towards finding a condominium to purchase. Yesterday we met for the first time with an agent and went to view condos at four different locations. Unlike in the United States, you don’t work exclusively with one agent because there are not universal listings. Any given agent will only be aware of a limited number of available properties. 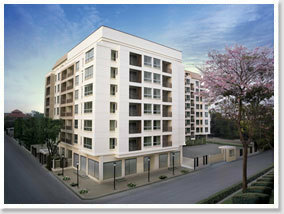 In this case our agent works for Plus Properties, a developer of medium-sized projects usually aimed at the mid-market. He also handles some properties that aren’t developed by Plus, and he seems very willing to work with us to look at a variety of places. We’ve been frank that we don’t expect to purchase anything in the next three months. We’ve also been firm about our price range: 4-5 million baht. The challenge, I think, is that what we’re looking for needs to serve two purposes. Our strategy is, in the short term (3-5 years) for the condo to be the place we live. After that we anticipate buying another place, possibly an actual house or a larger condominium or maybe we’ll be living with Tawn’s parents by then – who knows? – and using this first condo as a rental property. So it needs to be sufficiently large to meet our living needs now, but also has to have features that would make it appealing for high-end renters (read: expats) in the future. Unfortunately, those features such as a swimming pool, fitness center, etc. are not necessarily important to us personally yet they help drive up the price. Two places we saw yesterday were in the Phra Khanong area (Sukhumvit 67-69), which is an appealing loation, just one stop from the end of the Sukhumvit Skytrain line. 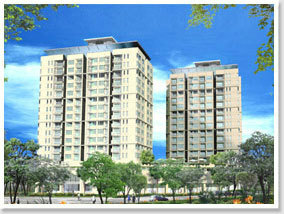 The first, at Plus Sukhumvit, is a mid-rise building (17 stories) only 3-4 minutes walk from the Skytrain. The 2 bedroom, 2 bath is a little small at 60 square meters (multiple by 10 for square feet) and the kitchen would be frustratingly small. But the facilities are very nice and the location is super-convenient for a renter. The second place, Plus 67, is on the north side of Sukhumvit and is a little deeper in the soi, about a 6 minute walk to the station. The 2 bed / 2 bath condo there is larger, 73 square meters, and the kitchen is a little more workable. But the facilities, while okay, aren’t that special. The slightly longer walk would be a drawback in renting, although not terrible. Both locations would require some remodeling work to replace cheap laminate floors and improve the kitchens. We’ll continue to look, especially along the Skytrain and subway lines, and see what else we can get for our money. With potential political and economic instability here, I’m not in a great rush to buy, but we’ll see how that plays out. My new responsibility is home nurse, taking care of Tawn over the past twenty-four hours as he’s been recovering from a bout of the stomach flu. I don’t know if it was something he ate or just a bug he acquired somewhere in the course of his day, but he was finally able to eat some plain congee last night and keep it down, so he must be heading towards health. As a result, we had to cancel dinner plans last night with a friend from San Francisco who is now working in Jakarta. He and his partner own a condo here in Khrungthep so no doubt there will be another opportunity to visit. 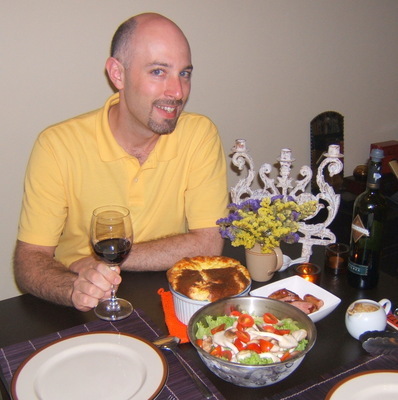 There’s also dinner plans this evening to cook with Tawn’s friend Ja at her cooking school. Hard to believe it has been six months since we last did that. After my Thai tutoring yesterday, an intense two hours learning about the Thai educational system – lots of technical vocabulary – Ken and Markus met me at Bitter Brown, the coffee shop / bistro where I do my lessons, for lunch. I decided to invite them to meet me there so they could meet my teacher, Khruu Kitiya. Ken is now living here and wants to start studying, and Markus studies intermittently but his tutor charges half again what Khun Kitiya charges. So hopefully they make some connection. Recently, I’ve been giving a lot of thought to planning and urban development issues here in the Big Mango. Urban planning is a field I briefly considered entering, and I took some prerequisite sociology courses at University of California, Riverside, during the six months I studied there. It build nicely off my experience doing architectural drafting during high school, which ended up being an area of emphasis. Ultimately, I won’t go back at this point and fulfill the educational requirements to work in the field, but it remains an area of interest. 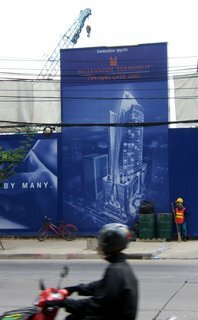 On my street alone, the seven-minute walk from the apartment to the corner of Sukhumvit Road, there is a ferocious amount of building and renovation activity. For example, across from the Siam Society there is a project (I think a condominium but maybe a hotel? 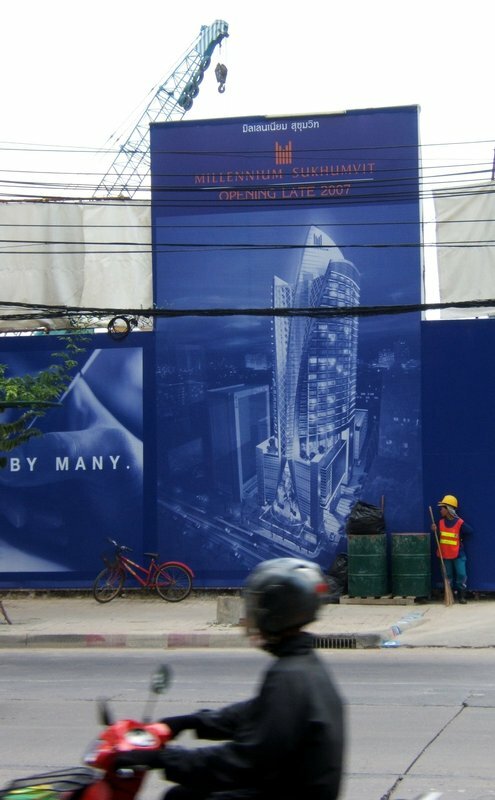 You can never tell the way they market buildings these days) called Millennium Sukhumvit. I posted this picture of the construction site in November 2005, shortly after I moved here. 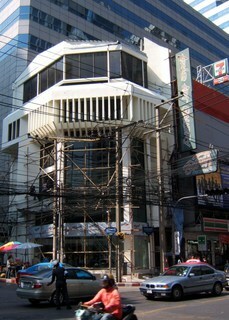 Just up the street from the Millennium Sukhumvit, on the opposite site, are a pair of older office buildings. One was occupied as a branch of Thai Military Bank until just a few months ago and is about eight stories tall. The other is about twelve stories and has been unoccupied since I moved here, but its car park in the back serves as overflow parking for the Siam Society (located next door) when they have events. Between the two in the front part of the property is a small one-story hawker center where I sometimes eat lunch – the yellow wall in the photo below is the hawker center. 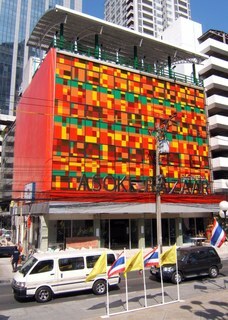 The Thai Military Bank building has the narrow windows behind it. I’ve noticed over the past week or so that workers have been gutting both buildings. Everything from insulation to HVAC vents (probably no heating, just VAC) to desks have been removed into dumpsters. Yesterday they started the process of breaking up the sidewalks and driveways surrounding the buildings, which leads me to believe that a full-scale demolition will occur soon. How would they do that, use explosives to implode the buildings? Maybe the other buildings are too close, though. 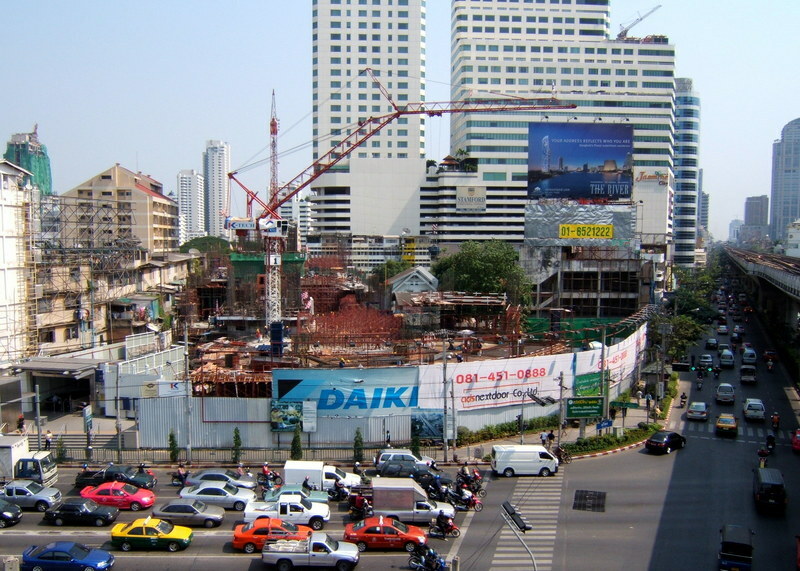 On the corner of Asoke and Sukhumvit, right next to the Skytrain and subway stations, on what must be one of the most valuable corners in the city, is a new construction site. 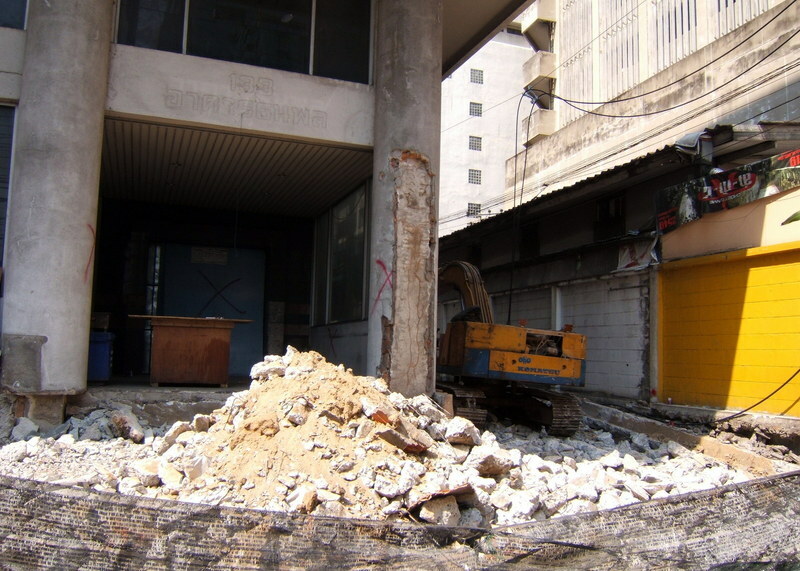 I think the entrance is technically one block over on Sukhumvit Soi 23, but it will front the main intersection. No signs indicating whether this is office space, condos, a hotel, retail, or a combination of things. It would be a good location for a mixed-use building although the footprint is a little small. What is interesting is how the property is key-shaped, the developers apparently not being able to buy the smaller abandoned shop houses to the right of the construction site. The entrance to the MRTA (subway) is on the far left of the picture. Interestingly, there is a billboard for The River, a high-end 70-story condominium complex to be build across the river from the Shangri-La Hotel. To put it in context, the Shangri-La and surrounding hotels are maybe 25-30 stories tall, if that. The State Tower (with the golden dome and outdoor bar and restaurant), which is the tallest building nearby and the second-tallest in the city, is only 68 stories. Baiyoke II Tower is 81 but is further away. 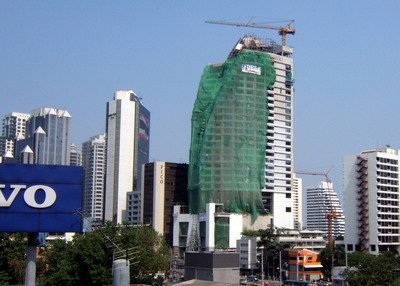 Subsequent to its approval, the Bangkok Metropolitan Authority has capped future riverside construction at eight stories. That’s right, eight. We’ve seen one project so far that makes it look like they will enforce that cap. This building, which used to be the Asoke Art Gallery and seems physically connected to the Phra-Samit Tower (behind it), has been ugly from day one. Dirty exterior concrete, broken sidewalk area around it, etc. They’ve been doing interior work to transform it into something and the inside is looking nice. This week they started painting and updating the exterior. 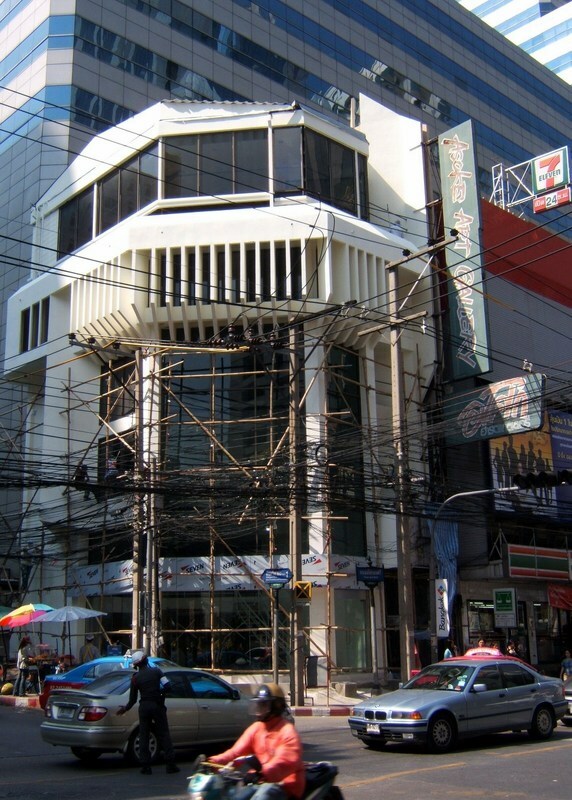 Sadly, no amount of work will remove the hideous web of cable and telephone wires that are tangled in front of it, so this building is destined to always be ugly. 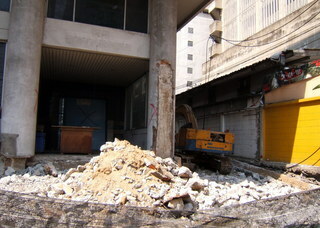 Of course, we recently had the recent renovation of the Asoke Bazaar building on Sukhumvit 21/1. I haven’t been in to see what is actually being sold there but the building has added some color to the neighborhood. Unfortunately the building owners put someone on the street corner most of the mid-day with a megaphone to bark announcements at passers-by about the grand bargains to be had at Asoke Bazaar. Noise pollution in a city that already has a plentiful supply of it. Bangkhonthiinai is located in Samut Songkhram, the smallest province in the Kingdom of Thailand and, befitting its gulf-side location, one of the largest producers of sea salt. Near the highway are an endless field of shallow pools, filled with seawater from nearby irrigation canals by the use of a rudimentary but age-old system of windmill-powered “buckets on a chain.” When the pools sit empty during rainy season they are just shallow fields, but during the rest of the year they become a thousand mirrors, reflecting the hazy pink sunrises and the brownish-blue late afternoons as I go to and return from the province. 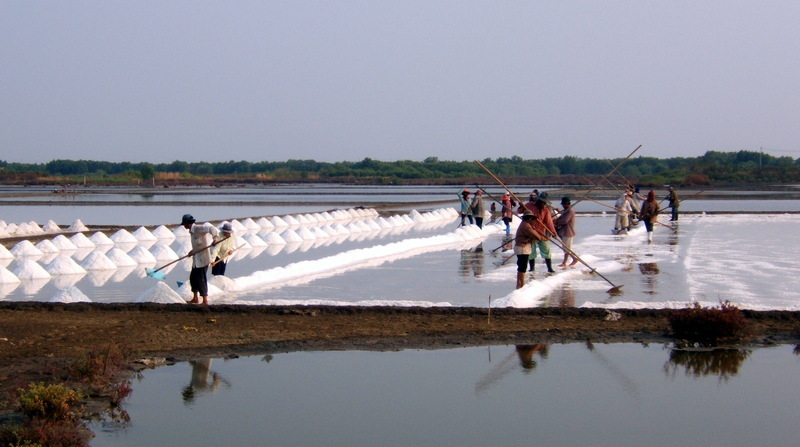 At least twice a year the salt is harvested, a manual process with long handled scoops that results in these orderly lines of small salt pyramids that are visually very appealing. The salt is then washed and processes and while most of it is shipped off for sale elsewhere, the highway is dotted by small stands selling bags of locally produced sea salt in every size from a few grams to fifty kilos. We have spent a lot of time focusing on vocabulary acquisition, to the detriment of sentence construction. There were many cases where students could identify elements of a photograph but lacked the verbs and prepositions to tie them together. Thus, we had “dog” and “man” and, in Thai, “sleeps on.” But we couldn’t put that together in English. I think that each week we need to practice making sentences about a photograph or scenario, as well as practicing vocabulary. The other thing that everyone, even the otherwise high performing sixth graders, had trouble with was the spelling. So we’re going to institute spelling quizzes every week. Spelling English is a bear, I realize, but once you know how sounds are constructed it makes it easier to read unfamiliar words. All in all, the tests were well-received. No anxiety, little whining. The way we did the testing, since it involved a lot of one-on-one work, meant that the students had a pretty relaxing day. Several did origami and one student made a large paper lotus that was surprisingly intricate. I think he has a crush on his teacher! After school a group of students were playing a game that was similar to jump rope except they used a long elastic band stretched between two students and a third jumped into and out of it. If you looked really close (if the picture resolution was that high!) you would see that the elastic band is actually a chain of several hundred rubber bands carefully put together. How laborious! 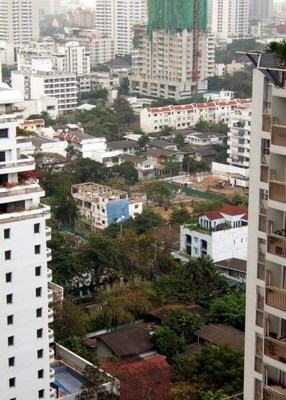 Construction of another condominium is commencing in our neighborhood, two blocks over on soi 23. There are currently five or six projects I can see from our balcony. The specific area for this project is directly in the center of the picture, with a blue tarp on a small building that is being demolished to make way for the condo. The small green fences on either side of the condemned building mark the periphery of the construction site. As this neighborhood sits right at the crossroads of two rail transit lines, both of which will be expanded soon, and is just one subway stop from what will become the in-town terminal for the airport express train, I’m very supportive of the idea of in-fill growth. Increased density of housing will make much better use of land and promote the use of transit. The problem is, the projects being built here are upper mid range and higher. If the in-fill is going to help reduce overall traffic, there needs to be housing built here for the middle and lower-middle range (as well as the low-end but those areas are actually well-established in Khlong Toei). Without it, the spread of middle and lower-middle range suburban style housing estates will flourish on the outskirts of Khrungthep, and with them an army of citizens and their fleet of cars that have no good transit options and opt to drive in to work every day. Never having heard her shout like that, I feared that perhaps my niece was being particularly naughty. 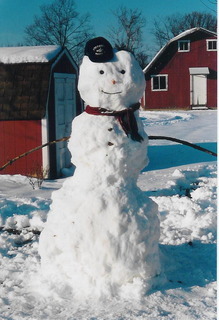 As it turned out, while she was sitting in the living room talking to me on the phone, a group of teenagers pulled up in a car, ran out and slaughtered the snow man in their front yard. All this while my niece was watching. Imagine the trauma and scarring! So I spoke with her a few minutes later and she was recounting how her snow man, named Frosty, had been made with a carrot nose and coal eyes. Then she told me that some boys had “bashed” Frosty and next time she would build the snow man next to the house, behind a wall. Good planning. I’m shocked, though, with such callous vandalism. What does that forbode for when they become older? Thievery? Knocking over old ladies in their walkers? Child abuse? It isn’t a good sign. Note: the photo is for representative purposes, only. It is amazing what you can accomplish if you start your day at 3:00 am. Tawn came home from his parents’ house at 2:00 Sunday morning after having had a very good conversation with his father about a dozen different subjects. Since Tawn didn’t have his house keys with him, he rang me up to come open the door. After settling in, he debriefed me on the conversation by which time my brain was fully awake and active again. So when Tawn decided to hit the hay at 3:00 I was unable to get back to sleep. Really, you can accomplish a lot if you start at 3:00. The internet connection, which has been noticeably impaired since the Taipei earthquake several weeks ago, zips right along in the middle of the night. I was able to complete another ten pages of my yearbook project on Shutterfly, which normally requires laboriously long and sometimes incomplete downloads. Of course I was a little bit tired by the time the sun rose, but by then I was in the car with two bicycles strapped on the back, on my way to pick up Markus. We did a shorter than usual 20 km ride out near Minburi in a morning with air so humid you could top a latte with a scoop of it. Speaking of which, since we rode less than normal that afforded time for a coffee before he headed off to church. Okay, I’m not superman: I did have a twenty minute power nap after I came home. 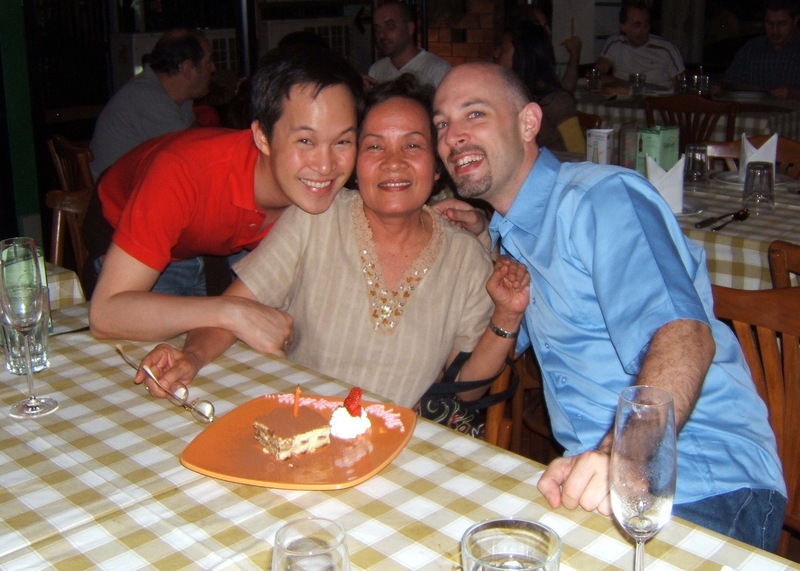 Then Tawn and I met Tod for lunch at Bug and Bee, Otto and Han’s little find in the Silom area. The food is tasty but you can’t be in a rush, for the service is erratic. After lunch we plugged in our laptops and Tod and I developed the examination we’re going to administer to the students this week. 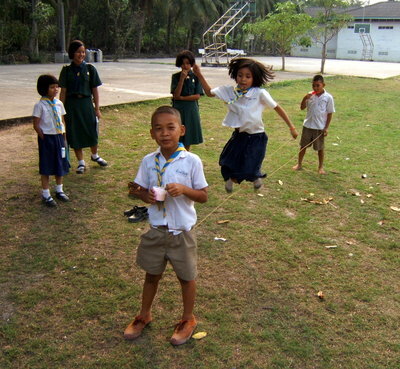 Nearing the end of the academic year in Thailand (another seven weeks or so) Ajarn Yai has asked us to assess the students as part of their overall progress report. For some reason, after lunch we decided to run errands up on Thanon Ratchadapisek, which is what our street (Asoke) becomes when it crosses the Rama IX expressway. Traffic can be messy up there and sure enough, it was heavy. We inched our way to Carrefour and HomePro, fought the crowds inside, and then inched our way back home. Inching aside, I decided to whip up a nice Sunday dinner: Emmental cheese souffle, fried mixed sausages, and mixed green salad. The secret to the souffle is to keep it simple by using Jacques Pepin’s recipe from his mother, which she created as a new bride before anyone taught her that the egg whites are meant to be separated and beaten. Since there is no separation and beating, two more laborious steps are removed yet the results turn out just as beautifully. Saturday afternoon after a morning of running errands I headed home and Tawn picked up his mother from her home. Typical of many Thai housewives, Khun Nui doesn’t get out and have as much fun as she’d like, instead staying at home and running the household. So on occasion we try to spirit her away so she can have some fun without Tawn’s father! First stop was our apartment, where she sampled some homemade banana bread. Then after visiting for a while, we caught a taxi over to Basillico restaurant on Sukhumvit Soi 23. Having lived for two years in Italy way back in the years before Tawn’s birth (that would be, what, about sixteen years ago?) she is very much in her element in an Italian setting and can still speak proficient Italian. We ordered a bottle of prosecco and after not even half a glass she was tipsy. A plate of prosciutto and salami came and went, then a bowl of ham and pea risotto followed by a thin-crust pizza. She started to flirt with the Italian chef who was making pizzas in front of the wood-fired oven smack dab in the middle of the room. “Bravo! Bravo!” she shouted each time he tossed another pie in the air. Three times the lights dimmed, a birthday cake with blazing candles was accompanied to the celebrant’s table with a host of off-key waiters singing the Thai version of “Happy Birthday” which is like the American version only to a slightly Salsa beat. The fourth time the cake arrived at our table, surprising Tawn’s mother whose birthday is this coming week. Needless to say she was not only tipsy but very happy. Tawn took her home in a taxi while I walked back to the apartment. Once home, Tawn ended up having a very long and very good heart-to-heart conversation with his father, not arriving back until 2:00! Then he proceeded to tell me about the very long and very good heart-to-heart conversation, which is why I am now awake at 3:00.